Poster Warehouse Sale: Save over 50%! Talk with Donna about ordering 50+ of any one of the 6 posters in Unlimited Potential poster set and get an even larger discount. Going digital poster sale! This is a final chance for your school, district or state to stock up on ready-made female role model posters at an amazing price. 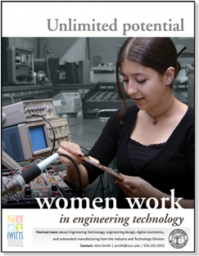 We've been been printing posters of women in STEM and CTE for schools for decades because we know how critical it is to have images of female role models in school hallways, classrooms, around campus and at career fairs. Sadly, the costs for storing and handling these beautiful posters have skyrocketed and we have to go digital. We can't bear the thought of destroying these print posters, so please help us find a good home for them! This is your one-time chance to get these posters (with option for customizable labels) at this price. Poster Warehouse Sale: Click "Add to Cart" to save 50% to 70% on poster sets now, or if you'd like to order 50+ of any poster talk with Donna to an even better deal. What kind of feeling do female students get in your hallways and classrooms? Do they see mostly male faces in their science, technology, engineering and trades classes? Hanging posters like these sends an important message about who you are as a school. It says that you welcome female students, and support women in STEM and CTE career pathways. Display this set of six posters in your classrooms, library, cafeteria, counseling offices, hallways and all around campus. Posters are 22 x 17 inches. Schools Can Customize the Posters Themselves to Attract Even More Students! Add your school's program contact information and logo to each poster with customizable labels. We will include custom-sized labels and an easy-to-use Microsoft Word template so that you can add vital information about your programs to the posters! Add your contact details, information about your program, and your school's logo to each poster. Print them in your office on your own laser or inkjet printer. As easy as printing a mailing label! Order posters for every classroom in your school, district or region and save! Hi, I'm Donna Milgram, the Executive Director of IWITTS. We've been been printing posters of female role models for schools for decades because we know how critical it is to have images of female role models in school hallways, classrooms, around campus and at career fairs. Sadly, the costs for fulfillment of the posters has skyrocketed - posters are very fragile and need lots of care and extra packing. We've made the difficult decision to move to offering digital-only versions of our posters in the near future that schools can then print out on their own. Here's what that means for you: Your school, district or state has a one-time chance to stock up on ready-made female role model posters at an amazing price in our warehouse sale. If you are interested in ordering 50 posters or more in any one career pathway, then lets make a deal. You can get an especially good deal if you live in the Los Angeles, California area near our present fulfillment company. I can't bear the thought of destroying these posters! Please help me find them a good home. Lets Talk, I have times on my calendar. Why is it important to have these women in STEM posters on your campus? You are going to find that they will not only help your school with recruiting women and girls, they will also help raise awareness and create a cultural change on your campus. A Dean that I have worked with at two colleges told me that the posters started a conversation about women working in these fields that was positive. In automotive technology at the first college, and across multiple career pathways at his new college, students talked about how "cool" it was for women to work in these fields. The buzz on campus spread to faculty, who became more enthusiastic about their school's "Women's Initiative," a campaign to increase female students in predominantly male courses. "Now," he told me, "even male faculty are asking me, 'When is our next Women's Initiative team meeting?'" We cannot underestimate the importance of images in bringing about change. And when you have these posters up around your campus and in your community it sends a welcoming message from your school. I know you'll find these posters to be a valuable tool in your tool belt as you work towards increasing the number of female students in your classes, so don't miss this final chance! P.S. Don't forget, you can customize these posters for your programs! Add your program contact information and school logo, and attract even more students. It's as easy as printing out a mailing label.